Auto Pickup is a feature of Pro and Pro Plus subscription plans that lets you set up multiple "online" locations where Fotomoto can pick up high-resolution versions of your images as needed to create the prints and downloads ordered by your customers. This is very convenient for photographers who don't want to upload files every time a customer places an order. Most any web server via FTP, SFTP or HTTP. Use the robust features available in Amazon S3 (see their help documentation for details). It is possible to limit access to the images in a number of ways. Use FTP (or better yet SFTP) locations that require username/password authentication. Use basic authentication for HTTP, which is thoroughly documented at http://httpd.apache.org/docs/2.0/howto/auth.html. 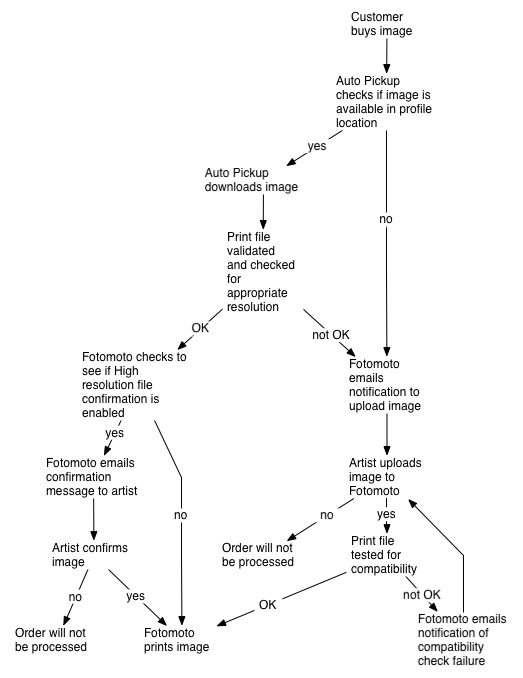 See our article that describes how you can give Fotomoto servers access. Some services barely require any setup! Click here if you're using FolioHD. Contact your hosting service to verify that you have the correct host name, path, username and password for the directory where you'll store your high-resolution files. If you're using FTP, SFTP or HTTP, we advise that you test your credentials in an FTP client application or browser to make sure they work before setting up Auto PIckup. The names of image files on your website need to be "matchable" to the names of your print image files. See below. We recommend putting all of your high resolution files in a single directory (or "bucket" on Amazon S3). You'll want to make sure each file has a unique name before putting them in the directory. Fotomoto uses "Lookup Patterns" to match your web and print files based on filename. For example, a Lookup Pattern can be used to find the print version of your image that has "_print" added to the filename. Here are a few examples of naming conventions that would work. Filename differences are shown in italics. We offer a Lookup Pattern Helper to help you find the right pattern for your needs. Go to the Auto Pickup page in your Fotomoto Dashboard. Click the "Create New Profile" button and fill in the fields under "Give Us Your Storage Information". NOTE: if you're not completely sure about your username, password, host name and search path, please check with your hosting service provider - the information needs to be correct for Auto Pickup to work. Click the Test Connection button - you should see a message that the test was successful. Create one or more Lookup Patterns that tell our system how to match your print files to your website image files. Click the "Use Lookup Pattern Helper" link if you need a hand. Click the "Save Profile" button and repeat the steps as needed to set up different storage locations. How to verify that Auto Pickup works! Last and most importantly, test Auto Pickup by verifying that it works for one of the images on your site. In your Fotomoto Dashboard, click the Store tab, then click the All Photos Album. Roll over the image that you want to check Auto Pickup on. Click the image info ("i") icon then click the orange "Check" button. You should see a message saying the file was found.